This Advanced Clothes Moth Kit is designed for treating a severe or widespread clothes moth infestation affecting several rooms or double wardrobes and contains a selection of moth killer products to enable you to achieve a fast knockdown and maintain successful clothes moth control for up to 6 months. Our Clothes Moth Control Kits offer the best moth products from Pest Expert and Rentokil to help you achieve a rapid knockdown of a clothes moth infestation and maintain effective control for up to 6 months. This Kit contains sufficient products to treat a severe or widespread clothes moth infestation affecting several rooms or wardrobes. 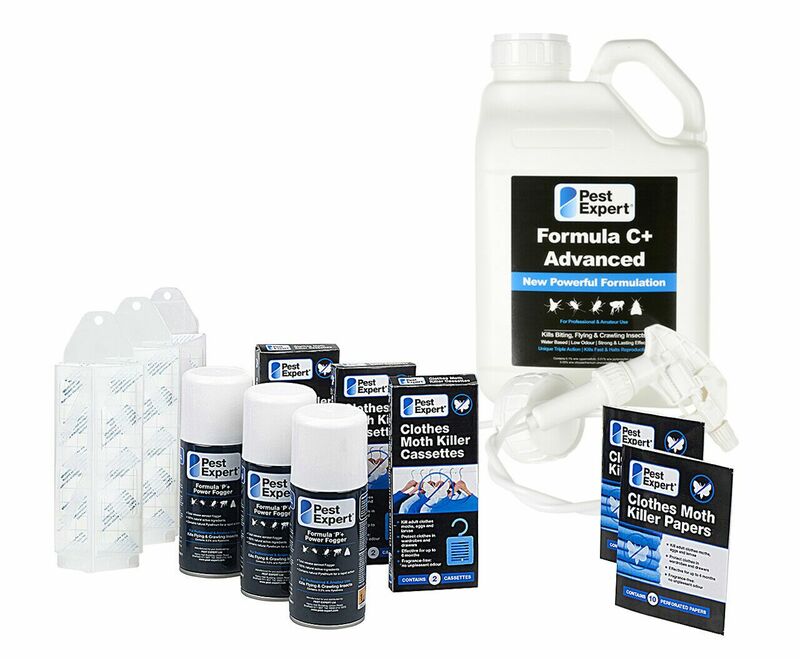 In addition to our best-selling Pest Expert Formula 'C' Clothes Moth Spray, this Kit also contains fumigating Formula 'P' Foggers, Rentokil Moth Killer Hanging Units, Rentokil Moth Killer Strips and Demi-Diamond Moth Traps. 1 x 5 litre Pest Expert Formula 'C' Clothes Moth Spray: Formula 'C' is a highly-effective moth killer that offers both fast-acting and long-lasting control. As well as killing clothes moths on contact it also leaves an insecticidal residue that continues to protect for up to 12 weeks. For application to the interiors of wardrobes and drawers. One 5Ltr container will treat up to 125m2. 3 x Pest Expert Formula 'P' Foggers: The Fogger is an aerosol fumigation device which releases an insecticidal gas, delivering a rapid knockdown of clothes and carpet moths. It does not need to be lit and so is perfectly safe for use in enclosed spaces like wardrobes. The gas leaves no visible deposits so will not taint or damage clothing or furniture. Each Fogger will treat one standard room or wardrobe. 6 x Rentokil Moth Killer Cassettes (3 Twinpacks): Designed to hang in wardrobes for the protection of woollen, silk and cashmere clothing. Contain ‘transfluthrin’ which not only kills adult clothes moths but also moth eggs and larvae. Odourless and non-staining, each Unit is effective for up to 6 months. One twinpack will protect a standard double wardrobe. 4 x Rentokil Moth Killer Strips (2 twinpacks): These foldable sheets can be cut to size and inserted into drawers to protect garments against clothes moths. Like the Moth Killer Hanging Units the Strips also contain transfluthrin and are odourless and non-staining. One strip will protect a large drawer or approx 1m3. 3 x Demi-Diamond Clothes Moth Traps: Ideal for aiding early detection of a moth infestation and for monitoring activity following treatment. The slow-release pheromone attracts the adult male moth, which disrupts the breeding cycle and helps reduce numbers. A pheromone pad lasts approx 6-8 weeks. All our Clothes Moth Kits are supplied with a professional advice sheet containing step-by-step instructions on how to use the products to carry out a successful treatment. If you’ve discovered those tell-tale holes in your clothes, then it is best to tackle the problem as soon as possible before moth numbers can increase and cause more extensive damage. As clothes moths are part of the Tineola species – a textile pest – they will feed on any natural fibres and can go on to attack woollen carpets, so early treatment is essential. Price includes FREE next day delivery! Nothing but great products and service from Pest-Expert! Have been buying different products to control different pests for a while and they always source the best products! Would 100% recommend! Great results, just what I was looking for!! Website was very informative and price were competitive! The kit has worked well and gotten rid of the moth issue on the top floor! Incredibly effective kit - one treatment has done the trick and once again, we're moth free! The three stages of this treatment kit worked so well! Fast delivery and outstanding results - cannot complain at that! Impressed by the service from Pest Expert - free delivery of a high quality clothes moth killer kit! Results were great and I've already recommended it!